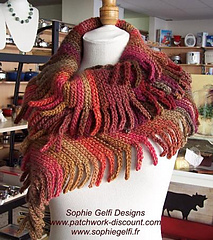 Warm and stretchy, this shawl with his fringy edges is easy to make. You only need to know how to do chain and slip stitches. If you have already made short rows it could help. It looks like garter stitch, but it’s much faster to do ! 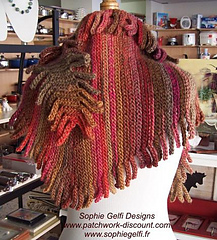 Any fancy yarn can be used, best results will be obtained with self striping yarn but plain color yarns are fine also. Pattern includes diagrams for every part of work and detail photos. Les explications de ce modèle en français sont incluses.